It is not surprising that the holiday season is one of the most expensive for individuals. Giftgiving, decorating and holiday treats can tap into the budget if a few general rules are not followed. JEHM Wealth & Retirement shares tips to avoid overspending this holiday season. To alleviate the stress of spending over the holiday season, a strict budget should be set even before the holiday season begins. If a person is giving gifts to a few individuals, their names can be written down and a budget planned for each individual. A decision should be made on how much to spend and how many gifts will be given. A budget should also incorporate holiday spending on food and decorations. It is easy to get into the festive mood during the holidays but that is when overspending creeps up on a person and they spend more money than they should. When a person decides to shop for items, it is easy to get tricked by retail stores. Even when a budget is firmly in place, many people tend to overspend. While it all comes down to discipline, retail stores are good at enticing money out of people’s wallets. When shopping smart, a person should watch for decoy pricing, loyalty cards and loss leaders. Often, a retail store will entice a buyer with a low-priced item. Unfortunately, that item will be sold out and require a person to spend even more money. However, there is a good way to save money when shopping for gifts. Gift cards are often discounted at chain stores such as Office Depot, Best Buy or Costco. Using these as gifts can help save a few extra dollars. One of the secrets to keeping a budget is to keep track of spending every day. While this is true throughout the year, it is especially important when a holiday season rolls around. Overspending during the holidays can quickly occur when a person is in a joyous mood or feels like they can splurge. Free online software that helps with budgeting can be used to track expenses or a simple pen and paper pad. It is easy to do when a person is out shopping for others–they see something that they like and treat themselves. In fact, statistics indicate that about 60 percent of individuals are giving themselves gifts during the holiday season. This can be limited by following an overall budget and writing down specific items to be bought when shopping online or in a brick-and-mortar store. Another caveat to watch out for is the purchase of gift cards. Over 70 percent of people shopping for gift cards will also purchase one item or more for themselves. Discipline must be followed so that a person does not overspend. If a person’s budget is tight, they shouldn’t feel guilty about purchasing less than in previous years, or not at all. Living comfortably without stress is much more important than handing out material goods. If a person’s budget is tighter than other years, they should decide early on how many gifts they are going to give. Setting limits also includes spending money on holiday decorations or food. It can all be budgeted. Happy Holidays! Investment Advisory Services offered through Retirement Wealth Advisors, (RWA) a Registered Investment Advisor. JEHM Wealth & Retirement Strategies and RWA are not affiliated. Investing involves risk including the potential loss of principal. No investment strategy can guarantee a profit or protect against loss in periods of declining values. Opinions expressed are subject to change without notice and are not intended as investment advice or to predict future performance. Past performance does not guarantee future results. Consult your financial professional before making any investment decision. This information is designed to provide general information on the subjects covered. Pursuant to IRS Circular 230, it is not, however, intended to provide specific legal or tax advice and cannot be used to avoid tax penalties or to promote, market, or recommend any tax plan or arrangement. 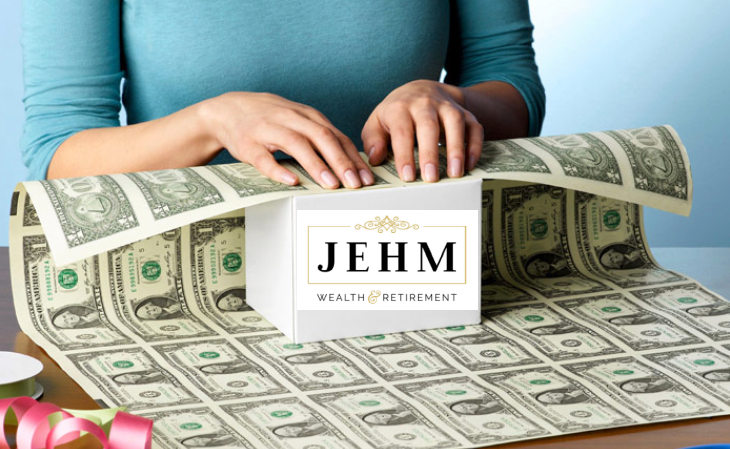 Please note that JEHM Wealth & Retirement Strategies and its affiliates do not give legal or tax advice. You are encouraged to consult your tax advisor or attorney.